Cupping is a standard massage technique of Paula's and therefore is incorporated on an as-needed basis in all Combo or Fasciae Therapy sessions. Although it is not advised, if you sincerely prefer to receive cupping only, you simply request it in the notes at booking or during the consult upon arrival. Cupping is vacuum therapy applied to the skin. Vacuum therapy is a method of using suction to lift and separate microscopic layers of connective tissue and to move stuck (congested) fluids, particularly superficial lymph, but also to help stretch the connective tissue inside a joint, from without. Traditionally, cupping is a practice used by doctors of Traditional Chinese Medicine (TCM). In New York, only licensed acupuncturists are allowed to practice TCM cupping. Massage cupping differs from TCM cupping primarily in length of time that a cup can sit, static, without moving. In TCM cupping, cups are usually placed and left in a singular location for much longer than a few minutes. In massage cupping, cups are usually gliding on the skin with the assistance of oils, and if the cups are not moving, it is never for longer than a few minutes. "Fire cupping" is a TCM practice only, never by massage therapists. Both TCM cupping and massage cupping are highly therapeutic, but the conditions they are used for will vary between professions, hence the separate licensing. Like other massage modalities, Paula uses cupping on an as-needed basis during regular therapeutic massage sessions. Although it is rare, a session could, potentially, subsist of only cupping. For efficiency and convenience for both therapist and client, Paula usually uses a cupping machine that can be set to any vacuum strength. On occasion, silicone cups may be employed, particularly when joint movement would be improved. Facial cups are sometimes employed when sinus issues are at hand. 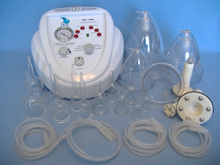 Gentle cupping by machine may be used during breast tissue flush treatments which are great for preparing for breast feeding, potentially reducing cancer risk and/or false-positive mammograms, or just general breast health.